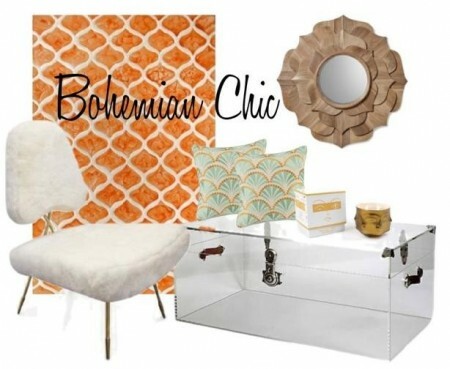 Bohemian Style is merging into modern to create an eclectic chic aes­thetic. The keys to achieving this high-​​end look are to embrace the mixing of pat­terns with tex­tures. Play with colors from oppo­site sides of the color wheel in dif­ferent tones with bright bold pops! Each piece should tell a story and/​or have a quirky whimsy attitude. The Lucite Trunk is our favorite way for any Bohemian to dis­play trea­sures from their globe-​​trotting. Per­fect use for any room and blends mas­cu­line with fem­i­nine with clean lines of modern decor.